As the weather improves and summer is upon us, we round up a selection of hotels that we think enjoy some of the best seaside locations in the UK. We love The Rosevine, a beautifully restored Georgian house up on the cliffs of the Roseland peninsula. With a mixture of studios, suites and self-catering accommodation, it's great for families and groups, but to be honest it's hard to imagine anyone not liking it here – there's lovely sandy beach two minutes' walk away, a good restaurant when you can't be bothered to cook, and the chintzily chic town of St Mawes nearby. This is another of our old favourites, and some say it enjoys the best seaside location in the UK, perched high above the magnificent beach of Saunton and the great expanse of dunes at Braunton Burrows just behind. It's been here a long time – the building itself is a fantastic 1930s throwback – but it has been careful to update itself over the years, and has a decent restaurant and nicely refurbished rooms, most of which inevitably have glorious views over the beach, and a host of great facilities, including several pools and a fitness centre. Mostly, though, it's the location - convenient not just for Saunton but all the other magnificent beaches that speckle this special stretch of the north Devon coast. Glamorously old-fashioned, this hotel offers a spectacular view of the sea from every room. It's perched on a headland high above the Towan, Tolcarne, Lusty Glaze and Porth beaches far below, halfway between the centre of Cornwall's Newquay and Fistral. The 57 rooms are spacious and contemporary, some with their own terraces. There are two pools, a spa, restaurant and bar – you won't need to leave this well-serviced site. Devon's Dartmouth is home to a modern establishment with a relaxed, welcoming vibe, and a restaurant and bar that are popular with locals as well as guests. Situated in a stylish townhouse, the 8 rooms are chic and tasteful. It's a short walk to the seafront, and there are plenty of scenic strolls, such as the coastal path to Brixham or Blackpool Sands. A sumptuous boutique hotel with panoramic sea views awaits you in Cornwall. Blue Hayes is a grand, aristocratic residence, located high on a clifftop. It has 6 capacious suites, some with views, others with patio gardens. The position is fabulous, there's a personal approach to service, a convivial bar and dining room and it's just a 5-minute walk into town. What more could you ask for? 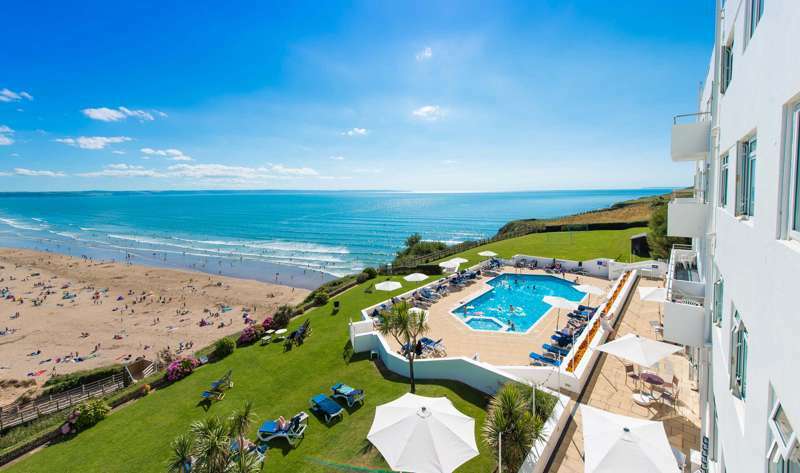 Here you have a beautifully situated, very well-equipped South Cornwall hotel, spa and resort set on a splendid private estate of lawns, mature woodland and a private 9-hole golf course. There's 57 rooms, a huge pool, an open fire and sauna, as well as a little terrace with a hot tub. It's the ideal place for both families and couples alike. A quirky hotel with 24 individually designed rooms and a laid-back atmosphere, this boutique spot by the sea in Brighton is decorated with an eccentric mix of upcycled and vintage furnishings. Most rooms have wonderful views out to the West Pier, and if you're feeling peckish, there's an all-day restaurant and tapas bar, The Set. Thirsty? The Fix is a cosy bar with an inventive menu. They have another coastal place in Penzance, an enviable location.